Life - could this be considered weird? Life. What is it? What distinguishes something that is "alive" from something that isn't. You try defining it. Although both inanimate objects and living things are made basically of chemicals, it's easy to distinguish between them. You'd recognise a human, a tree, a Tasmanian devil or a Japanese spider crab as being "alive", whereas, you'd know without a doubt that a rock, a golf club, an Uzi submachine gun or an intercontinental ballistic missile are definitely not. But, because of the fact that everything is constructed from chemicals, it puzzles scientists as to what the magic ingredient is that marks the difference. The individual molecules in a living organism seem to be put together in a way that defies explanation. Life could, therefore, be thought of as an anomaly and, in a way, weird. Several definitions have been proposed for the state of existence we call "alive". Most of these qualities can be mimicked by inanimate objects, thus flawing the definition. "Something that is alive consists of a system capable of reproducing itself". Well, many computer programmes can to this, too, as can crystals. "A live organism consumes fuel, can move around and expels waste products". So does a motor car. "A living human is made up of many interconnected components, all working together in a complex system". Once again, so is the motor car. The science of biology offers a selection of qualities that are found in living things: homeostasis (the ability to maintain the interior of the organism in a steady state, against outside influence), metabolism, reproduction, etc. So it goes on. In the end, Life cannot actually be defined, as it is a process rather than an object. Don't let this heading put you off. Entropy is defined as the natural way an organised system evolves towards a state of chaos, or non-organisation. The most convincing description of a living organism is that it displays "negative entropy", meaning that it maintains itself in an organised state, using energy obtained from the surrounding environment (food) and ejecting the remains of that material, after the required amount of energy has been removed. An actual definition of life still eludes scientists, for the reason stated at the end of the previous paragraph. It was once thought that inorganic material was totally distinct from the organic type. This was proposed in the 17th century and was generally accepted until the middle of the 19th century. This belief, known as "Vitalism", was eventually discredited when a scientist managed to synthesise the organic compound urea from inorganic material. This marked the beginning of organic chemistry. But this isn't actually the creation of life, is it? To have any idea of how life might be synthesised in the laboratory, it is necessary to try and work out how it started naturally, on Earth, in the first place. Currently, there is no "working model" to account for the spontaneous creation of living matter. Biologists are aware that, for life to originate, both proteins and genes must be present. The trouble is, you need genes to get proteins and proteins to get genes, so, which came first? Once again, that's a mystery. In 1952, a famous experiment was conducted, by two scientists, Stanley Miller and Harold Urey, at the University of Chicago. They set up an apparatus designed to mimic the atmospheric condition of a very young Earth, from the time life was thought to have formed and pass an electrical charge through it, to represent lightening. A gaseous mixture of methane, ammonia and hydrogen was sealed in the apparatus. A second container, containing water (representing the ocean) was heated up, to create water vapour by evaporation. When this mixed with the gases, a spark was fired between the electrodes (representing lightening). Thereafter, the mixture could escape down a tube, where it was cooled and returned to the section containing the water, where the cycle would begin again. Within a day or two, the water had turned pink. After leaving the experiment to run for two weeks, the water was found to contain several types of amino acid, which are used to make proteins in organic matter. 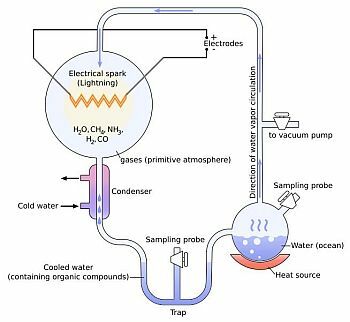 The Miller-Urey Experiment achieved its fame because it seemed to demonstrate how life might have originated on Earth, in the first place. A long-term experiment is currently underway at the Los Alamos National Laboratory in New Mexico. Headed by artificial life scientist, Steen Rasmussen, it is attempting to create a new form of living being from non-living matter. He's christened it the "bug". This new life form, to qualify as such, must be able to leave behind offspring that are able to improve through natural selection. Thus, at its most basic, any molecules involved must be capable of passing on hereditary information. There must also be some sort of metabolism and, finally, the whole thing has to be contained within a shell or membrane. Whereas a human is essentially a watery collection of molecules encased in an oily membrane, Rasmussen's "bug" will be oil based - little more than a blob of fatty acids (the sort of stuff that soap is made of). Regarding heredity, current living things use DNA to replicate genetic information. This is far too complicated for the "bug", so the plan is to use something called peptide nucleic acid (or PNA). A useful property of this molecule is that it has two forms - water repellant and oil repellant. These properties will be used to create a rudimentary form of replication. Metabolism, in its very simplest form, will be achieved by feeding the blob with certain chemicals that it can convert into more fatty acids. Eventually, enough will be created to cause the blob to grow and divide in two. The whole thing is still very much in the early stages, but, one day, there may be a true alien life form emerging in the southern United States. All these lab experiments notwithstanding, it is still not known for certain how life arose naturally and spontaneously on Earth. This doesn't sit well with the scientific community, who don't like the fact that it is somehow "special" - an anomaly. We've come a long way since our planet was considered to be the centre of the Universe. Our home in the cosmos is now known to be nothing special at all, so why should the life forms on it have some sort of unique quality? Life, theoretically, should be relatively easy to create, but it isn't. Perhaps it's not as obvious a process as Rasmussen and his ilk imagine it to be. Yet it appeared and established itself very quickly on our planet. So, what's the answer? One theory suggests that it arrived, fully formed, from outer space. Of course, we're only talking about microbes here, not highly evolved organisms like humans and the idea is not as far-fetched as it sounds. It is known that bits of the planet Mars have found their way to Earth. Lumps of it have been discovered in Antarctica. If martian meteorites have been hitting Earth since the time of the early solar system, then they will be coming from a planet far different from the one we know now. At one time, Mars had conditions, such as liquid water, that were conducive to growing life. Martian microbes could have hitched a ride on a meteorite and, effectively, seeded Earth. All well and good, but where did that life come from? It still remains a mystery, an anomaly - and weird.